Daytime royalty Maurice Benard and Eric Braden. Apparently soap actors can tear holes in the space-time continuum. 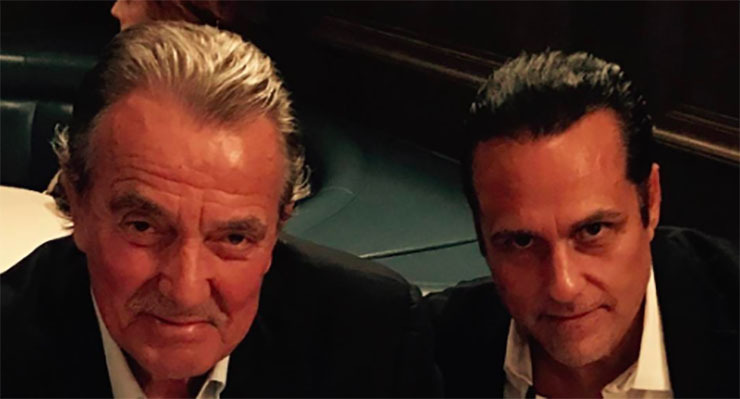 Sonny Corinthos and Victor Newman, from different soap universes, had a meal together! Er…wait, we mean General Hospital‘s Maurice Benard and The Young and the Restlesses‘ Eric Braeden. Don Corleone uttered the iconic phrase, “I’d like to thank the heads of the five families,” in his characteristic raspy voice in The Godfather. We could imagine Benard saying something similar when he and Braeden met for dinner. Stephen A. Smith, GH fan and guest star, and friend of both Benard’s and Braeden’s, arranged the get-together, which he was at too. Smith called the hang-out a “power dinner.” Indeed! All three posted to social media about it. See those below! Benard’s Instagram post caption documenting this event included the mysterious words, “You ain’t seen nothing yet.” We’re certain this is true, and can’t wait to see what these two have in store for us! @MauriceBenard @stephenasmith great conversation last night, Maurice! Enjoyed it a lot! Previous ArticleShould GH’s Jane Elliot as Tracy Q Be Recast? If So, With Whom?